A woven and half hitched paracord pouch, that I made to hold the 1/2 inch marbles I use for small monkey's fists and turks head knots. It also serves as a slingshot ammo pouch. About 30 feet of paracord was used, including the cinch cord/drawstring with cord lock. *Photo collage instruction sheet added. A Perma-Lok Lacing Needle and hemostats/forceps(or thin needle nosed pliers) can come in handy with making this project. *Added a video slide show for this project on YouTube. You have probably posted this before but I can't find it...where do you get the press slide gizmo? The thingy that holds it closed...whatever it's called. Hey I am a fan of your work... I was wondering if you can make a gear loft out of paracord cause recently my gear loft in my tent broke and instead of buying a new one I was wondering if there was a way to make one. Just wanted to let you know that you got at least one reader from Sweden :) Love your blog, keep up the good work! Hi, I am also a big fan of your knot work. I like the look of this pouch. How does it compare to the complete half-hitched pouches you have previously tied? Specifically which uses more cord, and which is more durable? Thanks again for all your work, and I will keep logging back in to see your newest knots. The woven and the half hitched pouches of the similar/same size, use about the same amount of paracord. The cow hitched version uses a little more cord with the extra hitches. Durability should also be similar since they're made of the same material. The half hitched and cow hitched pouches have more 'stretch' in them when fitting around their contents, where the woven pouch doesn't. WalMart has cord locks in the camping section now. I made the pouch! Well....mostly. I did finish it and it looks alright but not as clean as yours, especially the bottom half-hitching. How tight does the wrap around the can have to be? I found that mine became really tight on the last few stitches and nearly broke my plastic needle. I use a pen, pencil, or marker with the can when making the initial coils, to add a little more diameter to the pouch, and making enough extra slack in the cord around the can after removing it. It can get very tight finishing up the vertical weaves without doing that. For the pouch, it's okay if it's tight, but for can koozie use, you need it to be loose enough to get a can in and out. Love your work.. been a fan for a couple of years.. Thanks for posting the pics on how to do this.. will be finished by end of today!! You ROCK!! Hey, i've only been keeping up with your blog for a short time but it has be a huge inspiration for my own knot/braid work with paracord! what color is this gray you used and where did you get it? it looks GREAT! The photos are black and white, so the paracord color I used is actually a dark olive drab, that I was given for Christmas last year, so I don't know where it was purchased. Some vendors have two colors of olive listed, like the Supply Captain, OD Green and Dark OD. They also carry a standard gray color too. how did you thread the needle with the paracord? I've been having a tough time melting the end to a fine enough point to get into the back. I cut the paracord end to an angle/point, melt it a bit, then screw it right into the lacing needles threads. Here's an example link of how to do it, shown on YouTube. Have tried this twice and failed. It looks great until I remove the can then everything get's really really "loose". The bottom is great but the "wrapping" cords move around a lot and separate making it UGLY. Any advice? Sounds like there is too much slack in the weave when you take it off the can. Before starting on the bottom hitching, go back and work as much slack out of the weave, starting at the wraps and working all the way through the vertical weaving, until everything it really tight, but not bunched up, overlapping, or twisted. pouch tho, thanks a lot. i had no experience with anything like this before but im really happy with the outcome! top notch how to, all the best man! I wasn't really worried that my blunt Perma Lok needle might puncture the can(full/unopened), as the cord got tighter during weaving, and managed without an accident. with that in mind trust me to pick lucozade lol. would this process work with thick wool too by the way? im hoping to make one with a pocket on the front somehow too, any ideas for that? I don't know if wool or yarn would work, probably not being as 'stiff' as paracord is for structure, but it might be worth a try. I'd think the weaving would need to be tighter with more density, a lot more wraps, and closer weaving... more crochet like I think. Just made two of the pouches. One with a soda can and another with a water bottle. I found that as I tighten up on the water bottle, it came out better suited for a beer koozie than if I used the beer can. It was only about 1/8" wider than a 12oz. can. In order to have more room to work with, I used a sharpie marker to keep enough slack for weaving. I'm always inspired to try new knots after perusing your blog, SD. Keep it up. Ive just tried to make one of these pouches twice and failed. Everything goes well until I hit the half hitches at the bottom. For every loop up and down a loop is made at the bottom, do you only put 1 half hitch on each and then 1 hitch on each previous hitch until you reach the middle? @RChambers84, When you reach the bottom, hitch around each of the loops and the last horizontal wrap between them. This makes sure the transition from sides to bottom of the pouch is well connected without gaps. As you hitch round towards the center of the bottom, you can begin to skip every other hitch as you run out of room. Definitely some good stuff you've got posted here. I've got lots of odd lenghts of 550 cord, so i took this design and made it around a small Tylenol bottle to make a small pouch. Some minor design changes, but it brings me back to my boyhood re learning all these knots. I forgot how useful they could be. I've just discovered your site. Wonderful knotwork info. Thanks for the instructions on this one. I've seen a strikingly similar-looking thing (though probably not the same) in a Chinese art objects book. It was a ship's ballast woven of young rattan. Have you tried working with natural fibers (like rattan rope)? I think your stuff would look very good (and rustic) with it. @Ly, I haven't tried rattan rope. Besides leather, I've done some projects with hemp, cotton, and manila cordage, but it's sometimes harder to work with twisted cord instead of braided, since you have to make sure it doesn't unravel as you work with it. LOl@ ballast. I meant fender. I'm planning on trying this finer abaca (hemp) rope - I think it's the same as Manila cordage - and the ocean plait mat using thicker rope. Thanks again for providing tutorials! Hi Stormdrane! I made the woven pouch for a water bottle and the weaved portion turned out great. The half hitches at the bottom seem to be a problem for me, however. It seems that I'm making the pouch even longer because i'm forming this huge cone of half hitches...how do I get the bottom to flatten out? Do I need to tighten my hitches or pull them a certain way? I mean, by the time I finished the half hitches my half hitched portion was almost as tall as the weaved portion. Any advice? @Grayson, You need to reduce the number of hitches as you spiral towards the center of the bottom of the pouch. You do that by skipping every other hitch as you run out of room towards the center. thank you! It's not all that pretty on the bottom but it worked! With some practice it will be better. thank you so much for the advice. Hey i love the pouch! Wondering where you get your ball bearings? what size you normally use for monkeyfists!! Thanks! One question i have is, how rigid is this pouch supposed to be? I have made several per the slide show and my most recent one came out great, however, despite removing as much slack as possible the coils still shift and overlap. @Anonymous, You can vary how rigid the pouch is by how loose/tight the weaving is done. I have made can koozies with the same pattern that stand up and keep their shape when empty, and pouches that are soft enough to flatten and fold up when empty, but keep their shape. Sometimes the paracord itself can make a difference. Some cord is softer and flattens out, where some is firmer with a more round shape. I've had paracord with a loose fitting outer sheath over the inner strands, and prefer cord with a firmer, solid feel to it. 450 type paracord has loose fibrous inner strands compared to 550 paracord with twisted inner strands, and I prefer the 550 type for knot work. You can also vary the weaving, going over/under single strands, or two or three at a time, to get a a different look and feel as well. 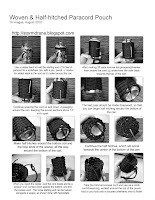 @The Mad Plumbarian, Find a cylinder shaped object, something like a section of PVC pipe or tubing, that is slightly larger than the bell, and tie the pouch in the same process as in the instructions. It will of course be smaller, using less cord, but the same tying method will apply. The pouch should be tall enough to close over the bell when finished. The magnet, depending on size/shape, may be glued in place at the bottom of the pouch, or possibly using excess cord after hitching the bottom, you might try to wrap the cord over/around the magnet(if disc shaped) a few times, securing it to the inside bottom of the pouch. You'd have to experiment with methods of securing the magnet. I haven't tried it but I'm sure something would work. Do you sell these pouches. I would by one from you. They are really cool. @Anonymous, I don't make the pouches to sell, since the time and effort involved in making them is more suited as a do-it-yourself project. Cord locks are available at most sewing/fabric stores, like JoAnn or New York Fabrics. They are on the notions wall, where the various helpful sewing gadgets are, like needles, bobbins, marking pencils, etc. They are more expensive than buying in bulk, but if you only want one or two it works. @Michael, I don't offer them for sale, but there are others(example from YouTube) that have followed the directions to make their own, even figuring ways to make improvements, and you might ask them if they'd be willing to sell what they've made. Check around ebay, etsy, artfire for things made with paracord and inquire with those knot tyers, and some of the online forums have buy/sell/trade sections where you can look or put in a request. yes i was wondering if you left the core in the paracord or did you gut it out? @Art, I left the inner strands of the paracord intact for this project, so it's not gutted. For some projects I have gutted the paracord for weaving, and it comes down to sometimes working better one way than the other. I love your site. I've made 5 pouches like these, and I am thinking of selling them in my etsy shop. How do you feel about people selling products made from your designs? Thanks. @Chapman, I don't mind if folks sell things they make from any designs I've shared, made using using long existing knot/braid/weaving techniques. Awesome job SD,every time i look for something knotty, youre there to supply! it took me one try to get everything down because of your video and website. Only things i had to do different are i used two shims(large paint markers) around the can, just to get enough room to move the needle around. Keep up the great work, I get a lot of inspiration from your site! How much paracord would you need to use if u wanted to use it to hold shoes or something? @Makethings, The possible variables on a larger project like that would suggest using enough to probably tie the pouch around a shoebox. So if 30 to 40 feet of paracord makes a small pouch or can koozie, you'd most likely need a several times that amount to cover a larger item. I can't give an exact number to an unknown set of variables for what would be a mathematical equation in figuring out a formula and answer. 45 feet makes a pouch the same diameter and about half as long (5.5 inches" as a can of Lysol for me. How would i make it so i could attach the pouch to a belt? @Makethings, There are various different ways you could make the pouch wearable on a belt. A couple of quick solutions would be adding zipties for belt loops, or add in another strand of paracord for a knotted belt loop, as done like this previous example, showing one added to a paracord sheath..
Also, I used the vertical hitch for the bottom. I like the way it turns out. @Anonymous, The finished pouch was stable enough with the cord I used and weaving over a couple of cords at a time. Some paracord is 'softer' than others and that may affect the finished pouch. I use regular 550 paracord that doesn't shrink up noticeably on me. If I wash it, I use cold tap water, liquid soap, and a soft bristle toothbrush to clean and rinse, so no shrinkage. Some types of paracord, like 450, have polyester content that may shrink, and boiling and drying with high heat may also affect the cord adversely, so I don't use those methods and have no problems. With this kind of pouch one end could be secured to a fixed part of my jeans (belt, loop, etc.) and the pouch would stay in the front pocket hiding the keys and especially without having the keys damaging the pocket. @Billy, For a smaller sized pouch, whether woven or hitched, you can use paracord or smaller diameter cord, and tie it around an object that is slightly larger than your keys will be when tucked inside. Here's an example of a half hitched/needle hitched pouch for a small flashlight. Great Blog. Thank you for sharing an such great inspiration. Love your work. You probably already answered this but as i read through some the previous comments i di dnot see this question. Did you pull the seven strands out of the paracord prior to making the pouch? 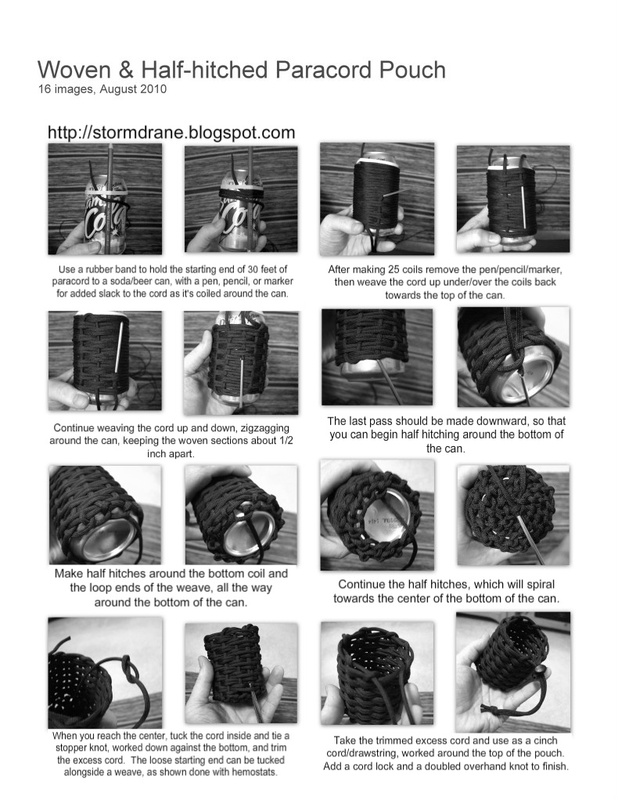 @joestack949, The paracord is not gutted, the inner strands remain intact. Any tips on how I could add a small loop for a clip? Can this be made tight enough to hold 3/8" (9mm) ball bearings or would they pop out through the sides? As long as you keep the weave tight, nothing should pop out through the finished pouch.